Deciding between the best home internet providers can be a daunting task, especially when you have to consider so many different options. Let us help make your decision easier by providing a list of the best internet services in your area. We've created a comparison chart with all the different major factors such as speed, bundle options, price, and coverage to help you find the best internet service that's tailored to your needs. All you need to do is enter your zip code below and choose which speed you'd prefer, and you'll be able to compare the top internet providers depending on your area such as AT&T and Verizon. You'll also be able to select bundle options which include phone and TV that you can bundle with your internet service. If you're still unsure on what internet provider you need, we've answered some common questions below to help you out. Whether you're uncertain on what speed you need, interested in fiber internet or want information on bundled plans, we've got you covered below with our guide to the best internet provider near you. What’s the best internet service provider near me? Your location is the most critical factor when choosing your home internet service because plans and prices are dependent on where you live. In our comparison chart, we ask you to enter your home address so we can show you the best prices in your area. Not all carriers and plans are available in every location so it's important to filter your address so you can see the best prices and plans that are available to you. After you've factored in location you also have to keep in mind what's most important to you. If you're a heavy internet user with several people in your home, then broadband speed should be an important factor. If you care more about price, then you might have to compromise what speed you choose and look into what bundle packages are available. 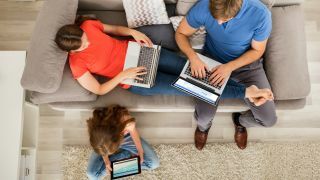 Determining what internet speed you need is dependent on several factors - how you use the internet, the number of people in your home, the amount of devices being used. If you have more than one person at home trying to stream movies or download videos, it might be wise to increase your bandwidth. For example, Netflix recommends 3Mb for one standard quality stream, 5Mb for a high-definition stream and 25Mb for an Ultra HD quality stream. You need to keep in mind that this is the recommended speed for the service on its own, not for your total internet speed. If you have several people in your home that are using different devices and streaming, you might want to get 30Mb to 50Mb. If you only use your internet for browsing the web and social media than you shouldn't need more than around 1Mb. Just like television, cable internet uses a cable to transmit data and is used to supply both the internet connection and TV at the same time. A fiber internet connection, on the other hand, is transmitted using fiber optic cable that's sent via small, flexible strands of glass that transmits light. Because the fiber connection is delivered on a dedicated line, it provides more consistent speed than cable internet. Fiber is also more expensive than cable internet and isn't as widely available from providers. If you're getting internet for a business then you might want to consider Fiber, but if you're just getting internet for yourself at home then you'd probably be happy with traditional cable internet. The decision comes down to your requirements and budget. Most carriers offer packages that include internet and cable, internet and phone or all three. You can also usually save money by bundling your services together because most carriers will offer discounts if you want to add cable TV or a home line to your internet service. For phone bundles, you can choose if you want to include national calls, mobile calls, and international calls which will all be a factor in determining the cost. When selecting what TV package you want, you should think about what TV channels are essential to you so you can choose the best package that includes those specific channels. Not interested in adding a phone line or cable? No worries! All carriers offer plans that include just the internet, so you don't have to pay for an additional service you don't want. If you're interested in a new phone we have the best phones for 2019 to hep you out. We also have the best cheap laptop deals that are going on and the best cheap monitor deals that are available now.